Methi (fenugreek : Trigonella foenum graecum) is known as a bitter seed that we add to tempering in everyday food but no one wants to eat mehti in larger amounts. Ayurveda has confirmed methi seeds as a wonderful home remedy for many conditions including management of diabetes, IBS (irritable bowel syndrome) and lactation etc. There is a reason why methi ki launji is served along with bedmi poori. Methi ka laddu and panjeeri is commonly made for new mothers in north Indian homes, to help with lactation and to generally have a better immunity during that phase. For everyday cooking methi has limited use but some people love a preparation called methi ki launji. Methi ki launji, also called as methi ki meethi chutney is a common accompaniment for Bedmi poori, several types of mung daal kachoris and even mathris, most probably paired to aid digestion of fried food. This methi ki chuntey is served at wedding feasts in Banaras too especially when the feast is pure vegetarian and traditional type. Marwari and Rajasthani families have it on their menu almost always as much as I know. Many families make this methi ki launji and each family has their own version. Drain the methi seeds, the water can be refrigerated and added to green tea if you like, this recipe uses methi seeds only. Some people boil the methi seeds and throw away the boiled water too, but I did not do this, the methi ki launji doesn't taste bitter even if I reserve the cooking liquid. Mix the soaked methi seeds, fennel seeds, chopped raisins and chopped dates with 2 cups of water and salt and pressure cook till the first whistle blows. Cool and remove the lid. Now add all the other ingredients and simmer till the chutney becomes thick almost like a jam. 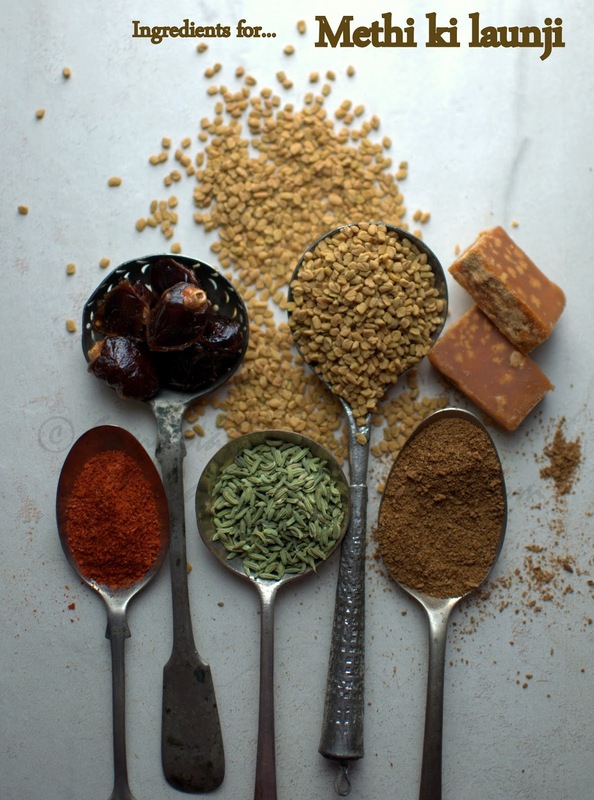 You can keep the chutney thinner but that tastes better when you use more jaggery or sugar as the syrupy chutney carries the other flavours well. I like this chutney less sweet and find the sweetness of the dates and raisins good enough to balance the bitterness of methi. The addition of clove, cinnamon and nutmeg powders is optional, they make more sense when there is some more sugar or jaggery in the chutney or launji. The methi seeds will taste bitter the first day when you make the chutney but from next day the bitterness will be gone. Some people can't even tell if there is methi in it, they mistake it for a lentil if they haven't eaten this chutney ever. This methi ki launji keeps well for a month if refrigerated. You can serve it with any Indian meals or even as a chutney with khakhra or pakodas. 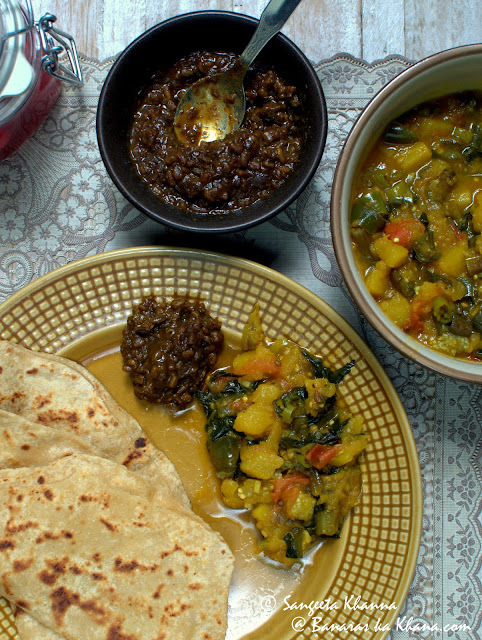 With some pumpkin subzi and crisp paratha or poori it is a combination made in heaven. Here is a pumpkin, brinjal and malabar spinach subzi that I keep repeating in this season because the few odd brinjals from the garden make good addition t o such mixed subzis. Malabar spinach is also from the garden. I have finished this methi ki chutney on its own sometimes. 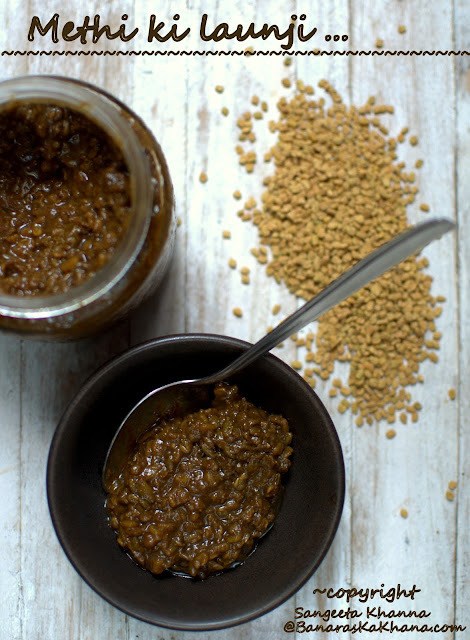 Have a good spoonful of this chutney with breakfast and dinner everyday to cure any joint pains and aches, but keep the sugar away from this chutney in that case. Call it mathi ki launji or methi ki chutney, it is a must try for poori type India meals I say. Sangeeta...this mehti launji reminded me of a masala powder by the same name. I had a delicious aloo subji a while back and my host showed me a masala powder she had used called methi chutni/methi launji. Have been on a hunt for that masala. Figured I would ask you...have you heard of this powder and do you have a recipe for it? I think I know this methi launji masala. Will get back to you after confirming the same. Thank you.